Two days ago, the Wall Street Journal published an article which portrayed moms heading off to conferences as deserting their families to party with other moms. To listen to Katherine Rosman, moms run off to these "so-called-conferences" to party with other moms, get drunk, eat lots of bad-for-you food, and tweet what companies ask them to tweet. The article even included an oh-so-helpful graphic showing how moms attend these events to sleep in, party, and raid the mini-bar while laying on the floor. Now I’m not sure what blogging conferences this author is talking about, but the ones I’ve gone to haven’t been like this. Granted, I haven’t been to a lot. Mainly just BlogHer 2010 and the Disney Social Media Moms events. Still, I’ve heard from plenty of other people who have gone to a lot of other events and they all tell similar tales. Is there partying? Sure, but that comes at the end of a long day of learning and networking. Are there company reps there and sponsorships? At many events, yes, but nobody is obligated to meet with them or to tweet/blog about their products. In many ways, this is no different than just about any other conference involving travel. Years back, the company I was working for sent me to a computer expo. I was there to learn about new technologies that were coming out. There was plenty of company information to collect, but there was also a lot of swag. (People crowded the Iomega booth to get their great buttons… buttons which I still have.) In addition, there were parties at night designed to wine and dine various attendees. I didn’t attend it, but I was invited to one party where I was assured that there’d be a hot tub and that I’d "have a good time." Just like the expo I attended way back when, you could go to a blogging event like BlogHer and just party and collect free swag, but you’d be missing the entire point of the event. Or you could attend just the seminars, avoid the company reps and parties, and come away having learned a lot. Most people take a middle of the road approach and do a little of each. The Wall Street Journal didn’t just insult moms with their article though. As a dad, I found it highly insulting as well. First of all, they insinuate that moms go to these conferences to lie around in a hotel room and let someone else clean up for once. As if dad never cleans up at home and mom is the only one who ever tidies the house up. The helpful graphic also insinuates that dad hogs the remote and doesn’t help get the kids ready for school either. The old stereotype of "dad the idiot who does nothing in the house while mom wears herself out doing everything" was quite clear. Congratulations, Wall Street Journal and Katherine Rosman for insulting both moms and dads in one article. Oh, and that graphic showing the mom eating from the mini-bar while laying on the floor? Have you SEEN some of those hotel room floors? I don’t walk on them barefoot much less lay down and eat off of them! 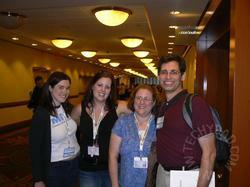 NOTE: The photo at the top of this post was taken at BlogHer 2010. Pictured are Christina (aka WELLInThisHouse), Jenn (aka KissMyKitty), B, and myself.